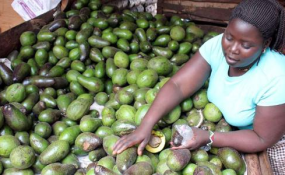 A trader selling avocados at Kangemi market in Nairobi (file photo). Kenya is turning to be an 'avocado nation' or it already has. The love for the nutritious fruit in Kenya is probably second to none. A walk around Nairobi streets during lunch time and you will not fail to spot someone enjoying an avocado. Some people love to take it plain, a but majority prefer mixing it with all kind of dishes preferably sukuma wiki, githeri, or madondo (beans). But Kenyans might have never imagined an opportunity would one day present itself where someone would be paid just to eat an avocado daily. Yes, you got that right. Now, a group of weight loss researchers from Loma Linda University School of Public Health in California, US are currently on the hunt for 1,000 avocado addicts who will be paid handsomely to eat an avocado every day for six months. Each study participants will get paid $300 (Sh30, 000) to eat an avocado (from their steady stream of the fruit) every single day for the six month period and will have their health stats monitored. The researcher are hoping to determine whether an avocado rich diet can help lose belly fat. To qualify as a candidate, one must be 25 years old and willing to either eat an avocado every day for half a year or abstain from eating more than two every two months. For the male candidate, ones' waist must measure at least 40 inches, and for the female it should be at least 35 inches. The research is being funded by Hass Avocado Board and those interested can apply at HAT study website.